So folks, it’s been a while since my last review. 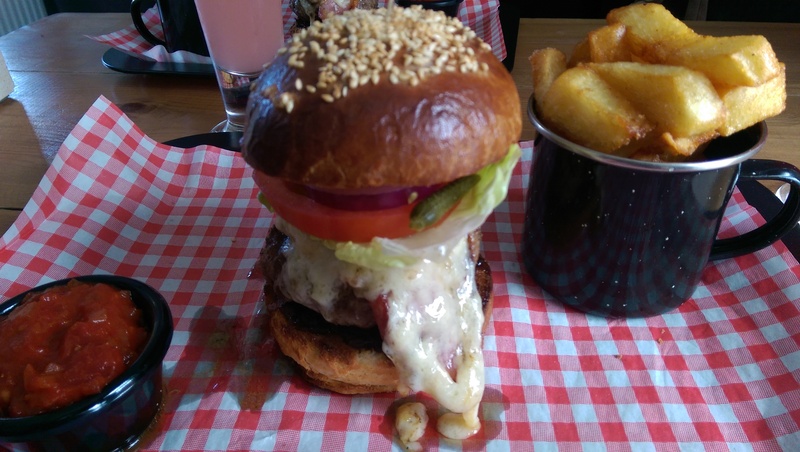 After an interview on BBC Radio Shropshire (I know, get me) I thought to myself “Good God, man, this is your blog about burgers; you need to get off your arse and start getting some more reviews under your belt”…so that’s exactly what I’ve done! The location for the first of two reviews this week was The Alb. A trendy cocktail bar and eatery, The Alb sits on Smithfield Road between the train and bus stations. I have had burgers here before; in fact before the Shrewsbury-leg of my stag do, I had the “Ultimate Alb-burger” from here. A mammoth thing consisting of two beef burgers, one topped with brie and bacon, the other with cheddar and mushrooms! Washed down with a couple (!) of pints, it was the perfect start to my stag do. Alas, despite taking pictures, with my wedding fast approaching, this beaut of a burger slipped through the net – bad times! But I wasn’t going to let that happen again. My wife and I decided to head to The Alb on a Sunday night. They have recently revamped their bar menu and it looks mega (see here). From BBQ belly pork, to steak, fish and chips, and open ciabattas – but you know me, I was interested in just one section…the burgers baby!! Following on from the aforementioned “Ultimate Alb-burger”, I was not expecting their standard beef burger to contend, especially for a modest £9! I ordered whilst sipping on a “Zombie #3” cocktail (well worth a try) and waited patiently! I have to say that The Alb is probably one of the friendliest and most accommodating places you will visit in Shrewsbury and certainly one of the quirkiest! From the bicycle hanging on the wall to the impressive moustache topiary of some of the staff, it is a great place to have a drink and – as I was soon to be reminded – to eat!! 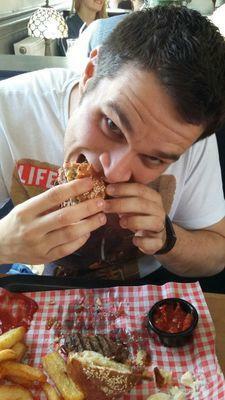 The burger arrived and the towering stack looked impressive – the photos I have taken seriously do it a disservice. I had already been told that the buns were homemade brioche and they definitely looked the part. Now, I love a gimmick (as readers will know due to a steak-top burger featuring prominently within the hall of fame) but that being said, I can think of nothing better than a burger that is well thought-out, where every aspect is the best it can possibly be. The reason I am saying all this is because, as I began to tuck in (picture to prove it), I was finding it hard to fault the burger…at all! The brioche bun was delicious and topped with fresh, crisp lettuce, tomatoes and gherkins (yes, even they were good and yes, I did eat them all). The bacon and cheese were delicious and I found myself experiencing a sweet taste which I hadn’t expected. This was a result of the caramelised onion casually hiding itself on the bottom bun (you sneaky little chap)……I have just had to stop writing to get some food because I am literally salivating at the thought of eating this again! The burger patty was thick and clearly not out of a box, unlike some I have reviewed on here (I will mention no names, *cough “Dragon Inn,Birmingham”, cough*). Juicy but not greasy – the way it should be! 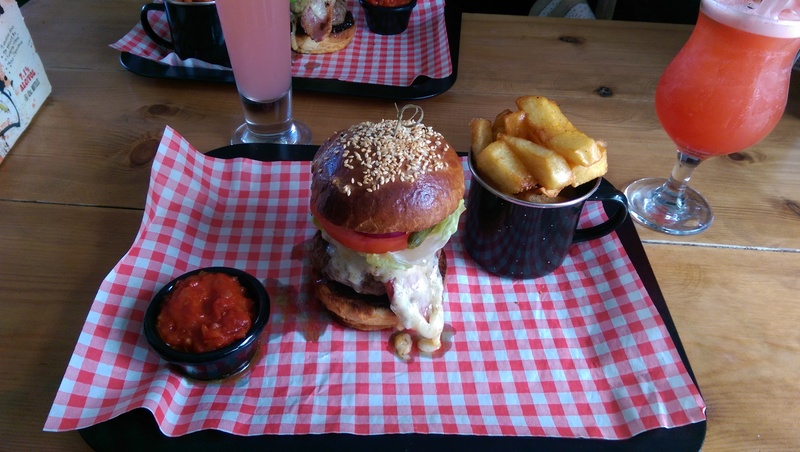 The burger was accompanied by chunky chips (always a firm favourite as you well know) and homemade tomato relish. On a previous occasion eating here, I asked for tomato ketchup and in doing this, a member of staff said “I told the chef you wanted ketchup and he can’t believe it – try his instead and I bet you won’t use ketchup”…he wasn’t wrong! Bloody lovely and a welcome accompaniment! As you can probably guess, I am getting excited about this one! By this point I had finished my “Zombie #3” and was talking to my wife (who incidentally had the same thing but with sweet potato fries – also incredible), and she too was loving her burger almost as much as I was – clearly we are meant to be together, if for no other reason! It’s hard doing this blog sometimes because I have to remind myself of the standard of the other meals I have had but for once, I was not struggling, this was seriously in contention for the top spot! But were there any bad points? Hmmmmm. I suppose one was the red and white chequered paper that lined the tray on which the meal was served started to struggle following the additions of sauces but in all honesty, this is such a minor thing that I am willing to let it slide. When you couple the quality of ingredients, really well thought-out ways of making the burger extra special and the friendly and quirky atmosphere, it is, in my humble opinion (and for the moment at least) the best burger I have had since writing this blog! BOOM! Needless to say, I will be heading back here frequently for food and I strongly advise you to do the same! Oh, and anywhere that presents your receipt like this deserves a medal!